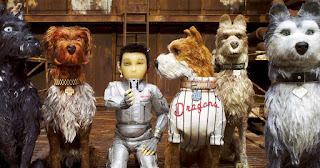 Directed by Wes Anderson and screenplay by Anderson from a story by Anderson, Roman Coppola, Jason Schwartzman, and Kunichi Nomura, Isle of Dogs is the story of a young boy in a futuristic, dystopian-Japan who travels to an island where dogs are living in exile due to an illness outbreak. The film is Anderson’s second stop-motion animated feature as it plays into a boy’s search for his dog where a group of dogs decide to help the boy as well as deal with being in exile because of a leader who hates dogs as the story is narrated by Courtney B. Vance. Featuring the voice cast of Bryan Cranston, Bill Murray, Edward Norton, Jeff Goldblum, Koyu Rankin, Greta Gerwig, Frances McDormand, Scarlett Johansson, Ken Watanabe, Fisher Stevens, Yoko Ono, Harvey Keitel, Liev Schreiber, Bob Balaban, Tilda Swinton, Frank Wood, and F. Murray Abraham. Isle of Dogs is a majestic and adventurous film from Wes Anderson. Following a mandate to ban dogs from a Japanese by its mayor claiming that dogs are spreading diseases as they’re consumed by a mysterious illness, the film revolves around a young boy who travels to an island of trash to find his dog. It’s a film with a simple story as it explores conspiracy theories and paranoia from the perspective of humans while the dogs are dealing with hunger, an on-going flu, and the horrific environment they live in. Wes Anderson’s screenplay opens with a prologue of a legend about the arrival of dogs in Japan and how it lead to this conflict between man vs. dog until a boy came to the aid of dogs and would make them man’s best friend. It’s a story that would be replayed in this futuristic version of Japan where a mayor who hates dogs decides to create something to get the public to have dogs banned as it is told in four parts by an unseen narrator. Yet, the main narrative involves the mayor’s nephew Atari (Koyu Rankin) wanting to retrieve his dog Spots (Liev Schreiber) whom he got just after Atari had been injured in a train crash that killed his parents. The need to retrieve Spots would have Atari land on this island filled with trash that was also the former site of a factory and amusement park where he would meet five dogs in Chief (Bryan Cranston), Boss (Bill Murray), Rex (Edward Norton), King (Bob Balaban), and Duke (Jeff Goldblum) where four of the dogs would help Atari find Spots but Chief is reluctant as he’s a stray dog that hasn’t known any loyalty to a master as he’s known to bite. Yet, the dogs would deal with a rescue team that has robotic dogs to attack where Chief decides to help Atari as it would play into this development between dog and boy, respectively, as it would also lead to some revelations to the former while giving the latter a sense of hope. The film also has subplots as it relates to students wanting to go against the mayor led by American foreign exchange student Tracy Walker (Greta Gerwig) who believes there’s a conspiracy happening involving the mayor and his cohorts where they are also attempting to shut down a scientist in Professor Watanabe (Akira Ito) from creating a cure for the dogs. Anderson’s direction is definitely intoxicating for the way he uses Japanese art and its architecture to create a world that is futuristic in some ways but also harkens to the tradition of the past. With the help of animation director Mark Waring, Anderson creates a film that does play into his visual sensibilities in terms of his precise compositions, camera movements, and offbeat humor. Yet, he would also utilize broad visuals to play into this world as the island of trash is desolate but also wild with rumors of cannibalistic dogs who eat other dogs. There are also these elements where Anderson uses satire as it relates to the rule and rhetoric of Mayor Kobayashi (Kunichi Nomura) that has similarities to current events in the world in how dogs are being treated as they’re sent to this island of trash with more plans to get rid of them altogether. Especially as Kobayashi has a henchman in Major Domo (Akira Takayama) who is trying to create more chaos where a lot of the visuals play into elements of suspense and drama. Anderson’s direction also has these tender moments as it relates to the developing relationship between Chief and Atari as it has bits of humor and drama with Chief carrying a secret of his own about his life as a stray dog when the subject of favorite foods emerge during a conversation with the other dogs. Many of the dialogue between the dogs are in English while the humans, with the exception of Tracy and a few translators, are in Japanese. It allows audience to see a world that is unique while unsettling at times as it plays into this growing tension for truth with the people in this Japanese city being told false things while Tracy is trying to reveal the truth with Atari making plans to return to the city with the dogs in the hope that the truth will come out. Overall, Anderson crafts a mesmerizing and exhilarating film about a boy who travels to an island of trash to find his dog. Cinematographer Tristan Oliver does excellent work with the film’s cinematography in the way many of the backgrounds are lit as well as the presentation of some of the interior settings in day and night in terms of the lighting. Editors Andrew Weisblum, Ralph Foster, and Edward Busch do brilliant work with the editing as it has elements of jump cuts and other stylish cut to play into the action and suspense as well as some of the drama. Production designers Paul Harrod and Adam Stockhausen, with art director Curt Enderle, do incredible work with the look of the city in all of its grand detail as it is a major highlight of the film as well as how it would look in the day and night as is the island of trash with its decayed buildings and other places in the island. Visual effects supervisors Lev Kolobov and Tim Ledbury do fantastic work with the visual effects as it is mainly bits of set dressing including scenes shown on a TV screen for the characters to watch as it help play into the stop-motion animated look. Sound editors Wayne Lemmer and Christopher Scarabosio do superb work with the sound in some of the sound effects involving the drones and robotic dogs as well as in some of the locations the characters are in. The film’s music by Alexandre Desplat is amazing for its usage of Japanese percussion and string music to help play into the drama and suspense as it’s another major highlight of the film while music supervisor Randall Poster provides a soundtrack that include a few score pieces of films by Akira Kurosawa and a song by The West Coast Pop Art Experimental Band that play for some of the adventure scenes. The casting by Douglas Aibel and Kunichi Nomura is incredible as it features some small yet notable voice roles from co-writer Nomura as Mayor Kobayashi in all of his grandiose persona as well as Yoko Ono as Professor Watanabe’s assistant, Ken Watanabe as a head surgeon who helped Atari following the train crash, Fisher Stevens as a dog named Scraps whom Spots meet as he would tell him about cannibal dogs, Kara Hayward as a female dog named Peppermint, Anjelica Huston as a mute dog, Frank Wood as translator machine, Yojiro Noda as a news anchor, Nijiro Murakami as a school newspaper editor, Akira Ito as Professor Watanabe as a scientist who wants to disprove Kobayashi’s claims while wanting to create a cure for the dogs, and Akira Takayama as Kobayashi’s right-hand man Major Domo who would help Kobayashi in creating the anti-dog propaganda. Liev Schreiber is terrific as Atari’s dog Spots who had been assigned to look after Atari following a near-fatal train crash while Harvey Keitel is superb as Gondo as a dog who leads a group of his own. F. Murray Abraham and Tilda Swinton are fantastic in their respective roles as Jupiter and Oracle as the former is a dog that helps the other dogs in finding Spots by showing them the way while the latter is a dog that claims to see the future as he’s really more into TV. Frances McDormand is excellent as Interpreter Nelson who would reveal the things that Kobayashi is saying while Greta Gerwig is wonderful as Tracy Walker as an American foreign exchange student who helps lead a student revolt against Kobayashi. Scarlett Johansson is brilliant as Nutmeg as a show-dog that convinces Chief to help Atari as she sees Atari as someone that can find the goodness in Chief. The quartet of Bob Balaban, Jeff Goldblum, Bill Murray, and Edward Norton in their respective roles as King, Duke, Boss, and Rex are brilliant as the four dogs who have been treated well by their masters as they’re willing to help Atari find Spots while dealing with Chief’s reluctance. Koyu Rankin is remarkable as Atari as Kobayashi’s nephew who is eager to find his dog as he endures injuries and heartache as he is determined to get his dog back while befriending the other dogs including Chief. Finally, there’s Bryan Cranston in a phenomenal performance as Chief as a stray dog who has endured being captured and in a lot of fights who is reluctant to help Atari due to his own mistrusts towards humans where he later finds a sense of trust as well as a role that is far more important than himself. Isle of Dogs is a tremendous film from Wes Anderson. Featuring a great cast, gorgeous visuals, top-notch stop-motion animation, amazing set designs, and a thrilling score by Alexandre Desplat. The film is an exciting yet compelling adventure film that takes a simple concept and inject some real-life allegories about the world as it all plays for a boy’s love for his dog. In the end, Isle of Dogs is a spectacular film from Wes Anderson. I'm torn on this. I don't like how Anderson treats animals in his movies in general but I'm kind of intrigued. My theater hasn't gotten this yet. I'm so glad to read this review! I felt fairly divided from the trailer but I'm definitely going to see it now. @Brittani-This is actually an enjoyable film as I was moved by it due to the fact that I used to have a dog and still love dogs. It's also very funny. @Allie Adkins-It's worth a watch as it's just a lot of fun as well as being very engaging in its approach to adventure.